Name Variation Olearius Leonard Dale was also known as Leonard Olearius. Olearius Leonard Dale was born on 6 May 1881 at South Dakota twin with Gurie B. As of 1930, Olearius Leonard Dale was never married. [S250] U.S. Federal Census 1930 U.S. Federal Census, by Ancestry.com, ED64-15. Dwelling 142. Gerhard Luther Dale was born on 10 November 1883 at South Dakota. As of 1930, Gerhard Luther Dale was never married. He died on 20 July 1933 at Union, South Dakota, at age 49. Agnes Ingeborg Dale was born in April 1896 at South Dakota. She was the daughter of Rev. Elling Olearius Dale and Inger Marie Iverson. Ernest E. Johnson was born circa 1914. Arvid S. Holthe was born on 9 November 1941. He was the son of Norman Oscar Holthe and Sylvia Mae Solem. Arvid S. Holthe died on 13 June 1992 at age 50. Arvid S. Holthe obtained US Social Security Card at South Dakota; last residence Beresford, Union, South Dakota. Married Name 31 March 1946 As of 31 March 1946,her married name was Solem. Laura Burwitz was born on 9 December 1921. She was the daughter of Carl Louie Burwitz and Bertha (?). Laura Burwitz married Llewellyn A. Solem, son of Albert T. Solem and Clara E. Anderson, on 31 March 1946 at Yankton, South Dakota. Laura Burwitz died on 11 April 1995 at age 73. Laura Burwitz obtained US Social Security Card at South Dakota; last residence Fort Peck, Valley, Montana. Name Variation Albert John Tepoel was also known as Te Poel. Albert John Tepoel was born on 1 March 1878 at Nebraska. He was the son of Theodore Tepoel and Dorothea Ursen. Albert John Tepoel married Frances Florence Kutil in 1908 at Fremont, Nebraska. Albert John Tepoel died in 1964 at Akron, Iowa. Circa 1917 at World War I Draft Registration, Sioux City, Woodbury, Iowa. [S246] U.S. Federal Census 1880 U.S. Federal Census, by Ancestry.com, NA Film Number T9-0756 Page Number 358A. Married Name 1908 As of 1908,her married name was Tepoel. Frances Florence Kutil was born on 14 February 1874 at Baltimore, Maryland. 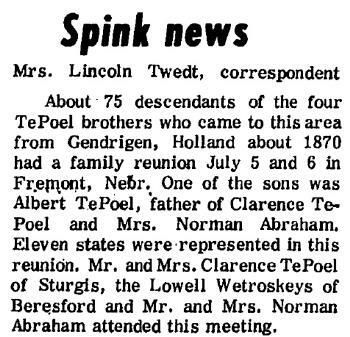 She married Albert John Tepoel, son of Theodore Tepoel and Dorothea Ursen, in 1908 at Fremont, Nebraska. Frances Florence Kutil died on 17 January 1972 at Akron, Iowa, at age 97 Mrs Albert J TePoel (Frances F Kutil) obituary. Name Variation Peggy Isabelle Goodroad was also known as Isabelle. Name Variation Peggy Isabelle Goodroad was also known as Esokell. Married Name 25 July 1920 As of 25 July 1920,her married name was Bruebaker. Married Name 6 August 1936 As of 6 August 1936,her married name was Abrahamson. She was the daughter of Edward Urwin Goodroad and Myrtle Bell Gardner. Peggy Isabelle Goodroad married Earl Howard Bruebaker, son of Mel Bruebaker and Lena Coverdale, on 25 July 1920 at Union, South Dakota. Peggy Isabelle Goodroad married Lewis Alvin Abrahamson, son of Andreas 'Andy' Abrahamson and Leise Oline Larson, on 6 August 1936 also reported as 6 Aug 1937. Peggy Isabelle Goodroad died on 9 January 1996 at Sacramento, California, at age 93. She was buried after 9 January 1996 at Mount Vernon Memorial Park, Fair Oaks, Sacramento, California. 1945 South Dakota State Census, Spink, Union, South Dakota Peggy Isabelle Goodroad appeared on the census of 1945 in the household of Lewis Alvin Abrahamson at South Dakota State Census, Spink, Union, South Dakota. Peggy Isabelle Goodroad obtained US Social Security Card at California; last residence Sacramento, Sacramento, California. [S9] South Dakota, South Dakota Birth Records South Dakota, State File Number: 619345 (unknown file date). [S243] U.S. Federal Census 1920 U.S. Federal Census, by Ancestry.com, ED55. Dwelling 114. [S250] U.S. Federal Census 1930 U.S. Federal Census, by Ancestry.com, ED64-15. Dwelling 33. Name Variation Edward Urwin Goodroad was also known as Eddie. Edward Urwin Goodroad was born on 22 March 1878 at Elk Point, Union, South Dakota. He was the son of William Goodroad and Ida Mae Brown. Edward Urwin Goodroad married Myrtle Bell Gardner, daughter of Joseph Ira Gardner and Mary Louise Juber, on 29 May 1899. 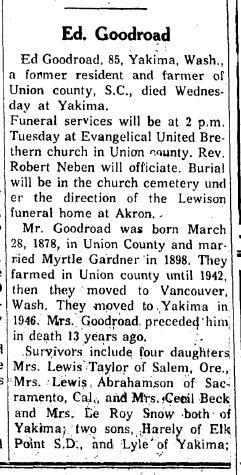 Edward Urwin Goodroad died on 17 April 1963 at Yakima, Yakima, Washington, at age 85 Ed Goodroad obituary. [S245] U.S. Federal Census 1900 U.S. Federal Census, by Ancestry.com, ED340. Dwelling 146. [S250] U.S. Federal Census 1930 U.S. Federal Census, by Ancestry.com, ED41-13. Dwelling 1. [S9] South Dakota, South Dakota Birth Records South Dakota, State File Number: 620611 (unknown file date). Married Name 29 May 1899 As of 29 May 1899,her married name was Goodroad. Myrtle Bell Gardner was born on 20 April 1881 at Union, South Dakota. She was the daughter of Joseph Ira Gardner and Mary Louise Juber. Myrtle Bell Gardner married Edward Urwin Goodroad, son of William Goodroad and Ida Mae Brown, on 29 May 1899. Myrtle Bell Gardner died on 8 June 1950 at Akron, Plymouth, Iowa, at age 69. Married Name 8 December 1951 As of 8 December 1951,her married name was Abrahamson. Lenora Vivian Jacobson was born on 26 August 1926 at at home, Sioux Falls, Minnehaha, South Dakota. She was the daughter of Richard Ossian Jacobson and Vivian Cornelia Johnson. Lenora Vivian Jacobson married Leo Alverne Abrahamson, son of Andreas 'Andy' Abrahamson and Leise Oline Larson, on 8 December 1951 at East Side Lutheran Church, Sioux Falls, Minnehaha, South Dakota. Lenora Vivian Jacobson died on 14 September 2000 at age 74. Lenora Vivian Jacobson obtained US Social Security Card at South Dakota; last residence Brandon, Minnehaha, South Dakota. She and Leo Alverne Abrahamson lived in 1990 at 712 Splitrock Blvd., Brandon, South Dakota. [S250] U.S. Federal Census 1930 U.S. Federal Census, by Ancestry.com, ED50-40. Dwelling 49. Name Variation Richard Ossian Jacobson was also known as Ossin Richard. Name Variation Richard Ossian Jacobson was also known as Richard Osian. Name Variation Richard Ossian Jacobson was also known as Richard Ossin. Richard Ossian Jacobson was born on 28 February 1894 at McCook, South Dakota. He was the son of John Jacobson and Emma C. Jonson. Richard Ossian Jacobson married Vivian Cornelia Johnson, daughter of Gerhard L. Johnson and Louisa J. Kaye, on 10 October 1925 at McCook, South Dakota. On 28 May 1917 at World War I Draft Registration, McCook, South Dakota. [S245] U.S. Federal Census 1900 U.S. Federal Census, by Ancestry.com, ED359. Dwelling 131. [S244] U.S. Federal Census 1910 U.S. Federal Census, by Ancestry.com, ED287. Dwelling 18. Married Name 10 October 1925 As of 10 October 1925,her married name was Jacobson. Vivian Cornelia Johnson was born circa 1907 at South Dakota. She was the daughter of Gerhard L. Johnson and Louisa J. Kaye. Vivian Cornelia Johnson married Richard Ossian Jacobson, son of John Jacobson and Emma C. Jonson, on 10 October 1925 at McCook, South Dakota. [S244] U.S. Federal Census 1910 U.S. Federal Census, by Ancestry.com, Year: 1910; Census Place: Township 1, Stanley, South Dakota; Roll T624_1488; Page: 3A; Enumeration District: 128; Image: 452. [S243] U.S. Federal Census 1920 U.S. Federal Census, by Ancestry.com, Year: 1920;Census Place: Sioux Falls Ward 10, Minnehaha, South Dakota; Roll 31109_4390883; Page: 17B; Enumeration District: 199; Image: 1066. Name Variation William Van Dam was also known as Vandam. William Van Dam was born circa 1892 at Holland. He married Martha Bult circa 1915. [S250] U.S. Federal Census 1930 U.S. Federal Census, by Ancestry.com, ED50-47. Dwelling 81. Married Name circa 1915 As of circa 1915,her married name was Vandam. Married Name circa 1915 As of circa 1915,her married name was Van Dam. Martha Bult was born on 30 October 1897 at Iowa. She married William Van Dam circa 1915. Martha Bult died in March 1975 at age 77. Martha Bult obtained US Social Security Card at South Dakota; last residence Dell Rapids, Minnehaha, South Dakota. Name Variation Catherine Van Dam was also known as Vandam. Married Name 23 June 1936 As of 23 June 1936,her married name was Persing. Catherine Van Dam was born circa 1916 at Iowa. She was the daughter of William Van Dam and Martha Bult. Catherine Van Dam married Leo Persing on 23 June 1936 at Minnehaha, South Dakota. Name Variation Marie C. Van Dam was also known as Vandam. Married Name 23 February 1938 As of 23 February 1938,her married name was Ellis. Marie C. Van Dam was born circa 1918 at Iowa. Marie C. Van Dam married Harold Ellis on 23 February 1938 at Minnehaha, South Dakota. Name Variation William Van Dam Jr. was also known as Vandam. William Van Dam Jr. was born circa 1920 at South Dakota. He was the son of William Van Dam and Martha Bult. Name Variation Clazine E. Van Dam was also known as Vandam. Name Variation Clazine E. Van Dam was also known as Clayzine. Married Name 22 April 1942 As of 22 April 1942,her married name was Zeig. Clazine E. Van Dam was born circa 1921 at South Dakota. Clazine E. Van Dam married Elphonsus J. Zeig on 22 April 1942 at Minnehaha, South Dakota. Name Variation Alvin Van Dam was also known as Vandam. Alvin Van Dam was born on 11 June 1927 at South Dakota. Alvin Van Dam died in March 1983 at age 55. Alvin Van Dam obtained US Social Security Card at South Dakota; last residence not specified. Clarence F. Tepoel was born on 10 April 1912 at Nebraska. He was the son of Albert John Tepoel and Frances Florence Kutil. Clarence F. Tepoel married Arline Reynolds, daughter of Hugh Reynolds and Anna Linstad, in 1945. Clarence F. Tepoel died in September 1987 at age 75. Clarence F. Tepoel obtained US Social Security Card at South Dakota; last residence Alcester, Union, South Dakota. In July 1975 at Fremont, Nebraska, TePoel family reunion. Married Name before 1937 As of before 1937,her married name was Sampson. Married Name 27 June 1939 As of 27 June 1939,her married name was Taylor. Married Name 28 May 1982 As of 28 May 1982,her married name was Farrow. Muriel Myrtle Goodroad was born on 26 September 1918 at Burbank, South Dakota. Muriel Myrtle Goodroad married Louis Carver Taylor, son of Perry Taylor and Verna (? ), on 27 June 1939 at Belle Fourche, Butte, South Dakota. Muriel Myrtle Goodroad married John Wesley Farrow on 28 May 1982 at Reno, Nevada. Harley John Goodroad was born on 24 April 1907 at South Dakota also reported as Iowa. He was the son of Edward Urwin Goodroad and Myrtle Bell Gardner. Harley John Goodroad married Irene Bertha Carlson, daughter of George Leonard Carlson and Emma M. Kiewel, on 5 October 1926 at Clay, South Dakota. Harley John Goodroad died on 12 August 1988 at Sioux City, Woodbury, Iowa, at age 81. Harley John Goodroad obtained US Social Security Card at Iowa; last residence Sioux City, Woodbury, Iowa. [S250] U.S. Federal Census 1930 U.S. Federal Census, by Ancestry.com, Year: 1930; Census Place: Spink, Union, South Dakota; Roll 2232; Page: 2B; Enumeration District: 15; Image: 220.0. Lyle Clell Goodroad was born on 4 February 1910 at Madison, Lake, South Dakota. Lyle Clell Goodroad married Berniece Louise Ramsey, daughter of Joshua Andrew Ramsey and Mabel Ethel Richards, on 25 December 1933 at Deadwood, Lawrence, South Dakota. 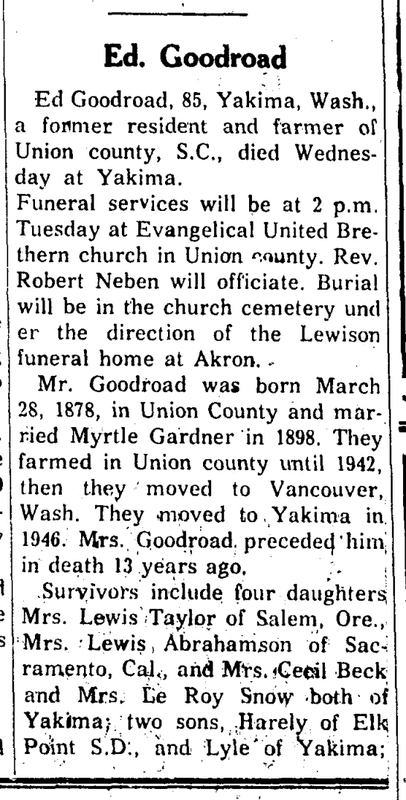 Lyle Clell Goodroad died on 19 April 1974 at Boise, Ada, Idaho, at age 64. Lyle Clell Goodroad obtained US Social Security Card at South Dakota; last residence New Plymouth, Payette, Idaho. Peter Golliet was born on 13 March 1868 at Rushford, Minnesota, also reported as Mar 1869. He was the son of Joseph Golliet and Anna Brunner. Peter Golliet married Elizabeth Ann Logan, daughter of James Logan and Eliza Jane Hogaboam, on 24 June 1896 at Grandin, Cass, North Dakota. Peter Golliet died on 18 September 1958 at age 90 The funeral of Peter Golliet, 90, long time Cass County farmer, will be at 2 Saturday in Hanson-Runsvol Chapel, the Rev. R. Robert Elkin, pastor of Grandin Presbyterian Church, officiating. John Gordon will sing with Ruth Fossum organist. Pallbearers will be Alfred and R.K. Rosenau, Roger Huseby, Conrad Woitzel, Leslie Lawrence, and Dunbar McSparron. Burial will be in Riverside Cemetary, Fargo. Mr. Golliet died Thursday. In recent years he had made his home with a daughter at Hillsboro, N.D. Born at Rushford, Minn., March 13, 1868, Mr. Golliet came to Dakota Territory with his parents in 1879, the family going to Kinyon Township. After Mr. Golliet grew to manhood, he farmed in the Grandin-Gardner area. He married Elizabeth A. Logan June 24, 1896. They continued to farm here until 1920 when they moved to Beach, N.D., returning to Cass County in 1935. Mrs. Golliet died in 1939 and he had resided with sons and daughters since. He leaves 3 sons, Homer P. Golliet, Durbin, N.D; Gleyn of Chicago, and Bly of Milwaukee; 6 daughters, Mrs. C.E. (Naomi) Akason, Hillsboro; Mrs. T.F. (Dorothea) Reid, Halstad, Minn; Mrs. Harold (Geraldine) Klokstad, Souris, N.D; Mrs. F. (Winifred) Hulett, Minot; Mrs. D.C. (Hollis) Haney, and Mrs. A.J. (Ruth) Abraham, both of Portland, Oregon; a half brother, Arthur Tenborg, Gardner, N.D; 20 grandchildren and 17 great grandchildren. He was buried after 18 September 1958 at Riverside Cemetery, Fargo, Cass, North Dakota. 1925 Beach, Golden Valley, North Dakota He appeared on the census of 1925 at Beach, Golden Valley, North Dakota. [S247] U.S. Federal Census 1870 U.S. Federal Census, by Ancestry.com, Year: 1870; Census Place: Rushford, Fillmore, Minnesota; Roll: T132_4; Page: 558; Image: 157; Family History Library Film: 830424. [S246] U.S. Federal Census 1880 U.S. Federal Census, by Ancestry.com, NA Film Number T9-0111 Page Number 318D. ED63. Page 12. [S245] U.S. Federal Census 1900 U.S. Federal Census, by Ancestry.com, ED36. Dwelling 251. [S244] U.S. Federal Census 1910 U.S. Federal Census, by Ancestry.com, ED32. Dwelling 143. [S250] U.S. Federal Census 1930 U.S. Federal Census, by Ancestry.com, ED17-1. Dwelling 213. Married Name 24 June 1896 As of 24 June 1896,her married name was Golliet. Elizabeth Ann Logan was born on 27 March 1876 at Toronto, Ontario, Canada. She was the daughter of James Logan and Eliza Jane Hogaboam. Elizabeth Ann Logan married Peter Golliet, son of Joseph Golliet and Anna Brunner, on 24 June 1896 at Grandin, Cass, North Dakota. Elizabeth Ann Logan died on 14 May 1939 at Gardner, North Dakota, at age 63. She was buried after 14 May 1939 at Riverside Cemetery, Fargo, Cass, North Dakota. 1925 Beach, Golden Valley, North Dakota Elizabeth Ann Logan appeared on the census of 1925 in the household of Peter Golliet at Beach, Golden Valley, North Dakota. Elizabeth Ann Logan had 6 with 6 living in 1910 children. [S329] Minnesota Death Index, 1908-2002 (published), Homer P. Golliet's death record lists Mother's Maiden Name: LOGAN. Married Name 1937 As of 1937,her married name was Haney. Hollis Marie Golliet was born on 14 January 1911 at Gardner, North Dakota, also reported as 13 Jan 1911. She was the daughter of Peter Golliet and Elizabeth Ann Logan. Hollis Marie Golliet married Darrell C. Haney in 1937. Hollis Marie Golliet died on 19 June 2008 at Multnomah, Oregon, at age 97 A memorial service will be at 1 p.m. Thursday, June 26, 2008, in Ross Hollywood Chapel for Hollis M. Haney, who died June 19 at age 97. Hollis M. Golliet was born Jan. 14, 1911, in Gardner, N.D. She was a registered nurse for St. Vincent Hospital and Kaiser Permanente and lived in the Portland area most of her life. She was a member and deaconess in the Evangelical Free Church and a volunteer for Kaiser, where she received the "Volunteer of the Decade" award. In 1937, she married C. Darrell Haney; he died in 1964. Survivors include her daughters, Patsy Wasserman and Peggy Miller; sister, Dorthea Reid; one grandchild; and two great-grandchildren. 1925 Beach, Golden Valley, North Dakota Hollis Marie Golliet appeared on the census of 1925 in the household of Peter Golliet at Beach, Golden Valley, North Dakota. Name Variation Dorothea Elizabeth Golliet was also known as Dorthea. Married Name 1 July 1940 As of 1 July 1940,her married name was Reid. Dorothea Elizabeth Golliet was born on 1 February 1915 at Gardner, North Dakota. Dorothea Elizabeth Golliet died after 2008. 1925 Beach, Golden Valley, North Dakota Dorothea Elizabeth Golliet appeared on the census of 1925 in the household of Peter Golliet at Beach, Golden Valley, North Dakota. Married Name Her married name was Klokstad. Geraldine Delores Golliet was born on 19 May 1921 at Beach, Golden Valley, North Dakota. Geraldine Delores Golliet died on 15 January 2001 at age 79. 1925 Beach, Golden Valley, North Dakota Geraldine Delores Golliet appeared on the census of 1925 in the household of Peter Golliet at Beach, Golden Valley, North Dakota. Geraldine Delores Golliet obtained US Social Security Card at North Dakota; last residence Souris, Bottineau, North Dakota.